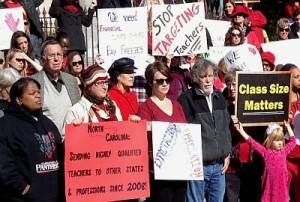 “Add to that the legislative dismantling of the state’s teacher-assistant program, lawmakers’ assault on the association that is a weak version of a teachers union, and an attempt to end teachers’ also-flimsy tenure rights, and it’s easy to see why they’re wearing out the exit door. A pay raise for new teachers, hiking their starting salary to $35,000, may help attract talent to North Carolina schools, but it won’t keep them here for long, because more experienced teachers have made little or no salary headway. That 10-year trend should be a reminder, too, that the decline in teacher salaries – from around the national median to something approaching the bottom of the barrel – is a bipartisan exercise. It started while Democrats controlled the legislative and executive branches, then was pushed along by the Republicans when they took over. Our lawmakers can pursue all the educational reform in the world, but it won’t work until we can attract and keep good teachers. We’ll do that when we boost salaries back to the national median.